The hermit lived in a hut in the woods. The hikers took shelter from the rain in a hut. The soldiers' huts were small and cramped. The troops were a long way from base, so they had to hut. The temporary farmworkers were hutted for the duration of the season. 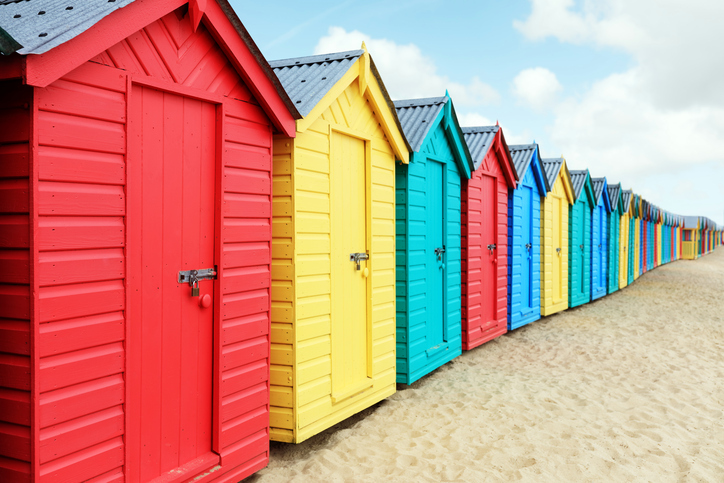 Beach huts are small, usually wooden, and often brightly painted buildings above the tideline on a beach. They are used for changing into swimsuits, sheltering from the sun, wind, or rain, and storing possessions. Some huts even have facilities for making hot drinks or basic food preparation, using bottled gas or mains electricity. You often find beach huts at beaches in the UK. Hut dates back to the mid-17th century. The noun hut, originally used only in the military sense, came into English from the French hutte, which means ‘a cottage,’ but its origin in Germanic. Most linguists think it came into French from a Frankish or other West Germanic source, which in turn came from the Old High German hütte or hüttea, and can be traced back to the Proto-Germanic hudjon– and the Proto-Indo-European root s(k)eu-, meaning ‘to cover or conceal.’ It is related to the Old Saxon hutta, the Danish hytte, the Swedish hytta, the Frisian and Middle Dutch hutte, and the Dutch hut, all with the same meaning, as well as many English words, including hide, hoard, hose, huddle, obscure, scum and even sky. The meaning expanded to any ‘small structure or dwelling’ by the end of the 17th century. The verb, which is now very rare, came from the noun, and first appeared in the late 17th century. It was mostly used in the military sense.